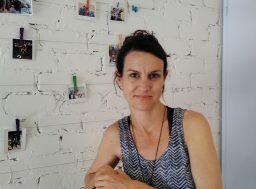 Travel report Israel in April 2016 | Desert Rose e. V.
Rahel, Ingo and Lucia from Desert Rose spent a week in Tel Aviv in order to meet with Sinai trafficking victims and to visit our partner organisation there. By meeting these people, we were once again confronted with the difficult life situation of the torture survivors who became victims of extreme human rights violation. Today, they are mostly living neither without a legal status nor government support in Israel. 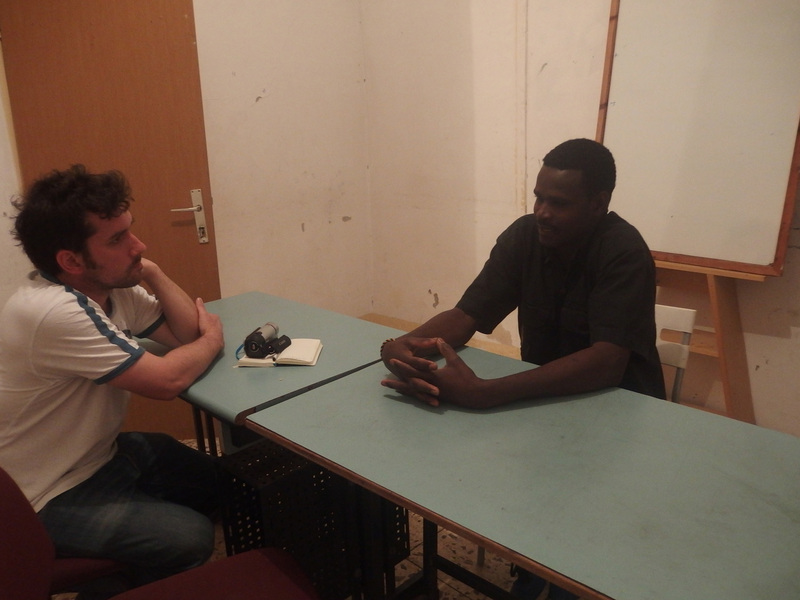 We were able to meet people who told us their stories of how they escaped from East Africa, of being tortured in the Sinai and of how they are struggling to survive in Tel Aviv. These stories are particularly shocking, filled with violence and cruelties, in a way that they are often beyond anything we could have imagined. It seems unreal and bizarre to talk about this in the gentle spring breeze in the city of Tel Aviv. We are not only touched by the brutality of these stories but also because they show the tremendous strengths of the survivors. They still have the will to live, even after having endured all these unimaginable cruelties in Sinai. They have the courage to move on, despite the brutality of life. We will publish some of these stories on the Desert Rose website soon. 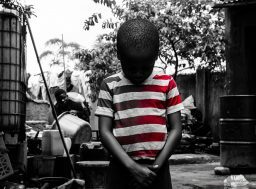 Furthermore, our website is supposed to function as a platform in order to present our own projects and initiatives, since we have not only met survivors, but also actors, poets, singers and pastors who create wonderful projects in their every day life. 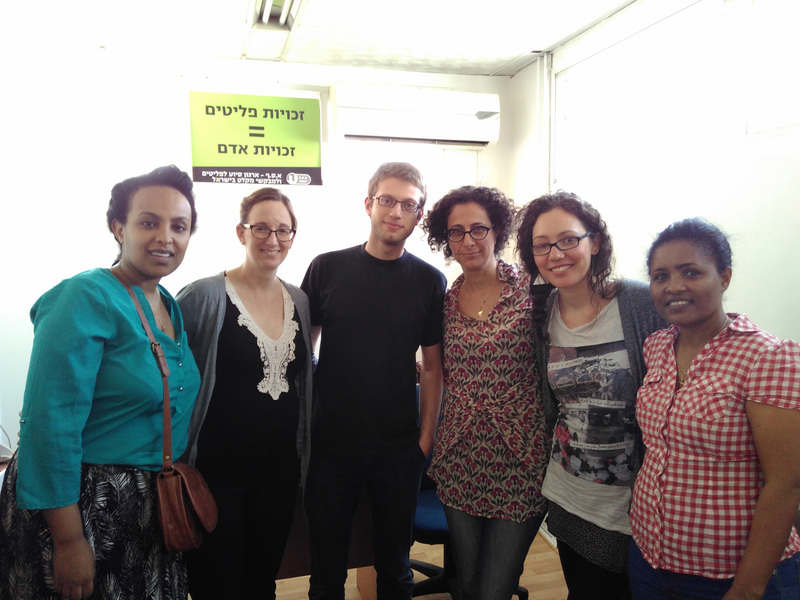 Visiting our partner organisations Assaf and Kuchinate, which are one of the few organisations that support Sinai-survivors in Israel, gave us a personal insight into their work. We also took the opportunity to talk about specific projects, which we, in order to help the survivors, would like to put into practice together. 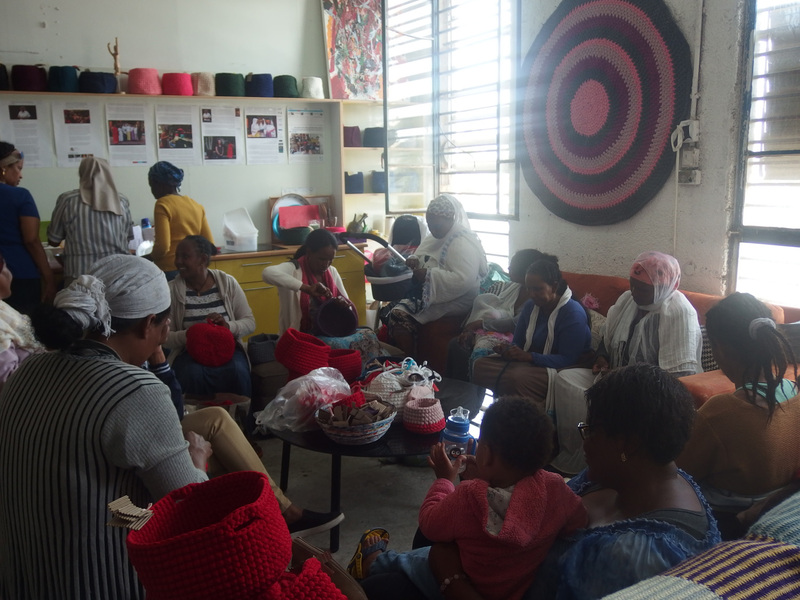 Kuchinate is a project, where more than 40 asylum-seeking women make crocheted products and a safe haven for them at the same time. We visited this place and the friendly and warm atmosphere there immediately overwhelmed us. 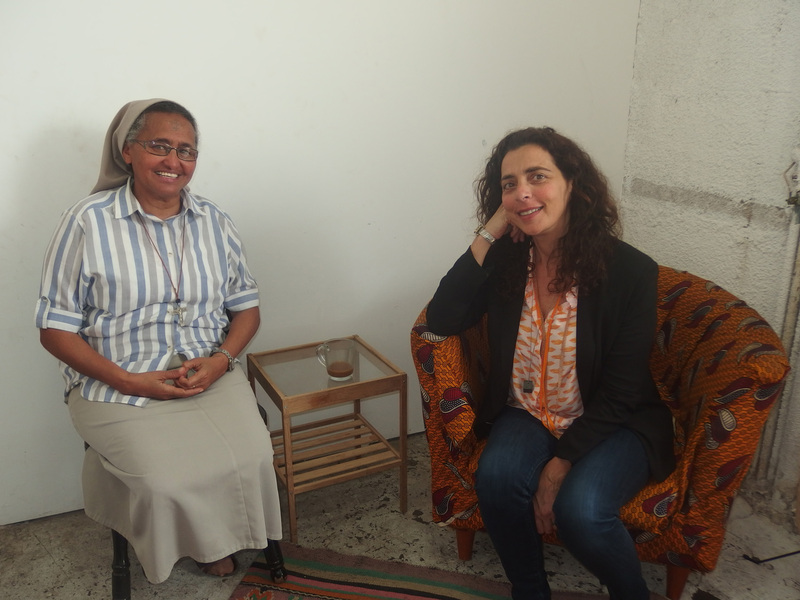 Among fabric pieces, scissor and colourful baskets, the energetic project managers Sister Aziza and Diddy Mymin Kahn told us about the women’s fates and about the financial problems of the little shop. We hope we are able to support this flagship project by initiating a campaign soon. When we visited our partner organisation Assaf, which provides socio-therapeutic support for refugees, we met employees who put all their energy into the work with the Sinai-survivors. So far, individual and group therapy have achieved considerable successes in coping with severe traumas in men and women but since there is not enough money, these therapies cannot be continued. In this regard as well, we would also like to endorse them with specific projects in the near future. All in all, our time in Israel was far too short and the misery much too profound to be able to make decisive changes. Far-reaching political changes are needed most. For instance, the legal recognition of the Sinai-survivors and place where they are safe and their emotional scars can heal – be it in Israel or elsewhere. Financial support and access to free medical and psychological help are also needed. The personal encounters with these victims are, however, particularly important because they show Sinai-survivors that the rest of the world knows they are not invisible to the rest of the world. It is vital that there are people who care about their fates and fight for their rights. For us, this visit was important to escape from our everyday life in Germany to see what we are fighting for: Overcoming one of the world’s least known humanitarian crisis. What was particularly depressing was a visit of the detention centre Holot, which is located in the Negev desert. Asylum-seeking men are sent there and have to stay there for several months or even years. They are allowed to leave the camp during the day, but they cannot go anywhere, since they are in the desert, far away from civilisation and surrounded by the notorious Saharonim prison and military sites. Due to difficult living conditions, many inmates in Holot are exposed to traumas; they do not get any psychological help. The guards in Holot are normally prison guards in the Saharonim prison, where felons and criminals are detained. Some of these inmates leave the centre to walk around in the hot desert sun, because they desperately try to forget all cruelties for a while. These inhuman conditions in the detention centre should scare off the refugees and make them decide to leave the country “voluntarily”. 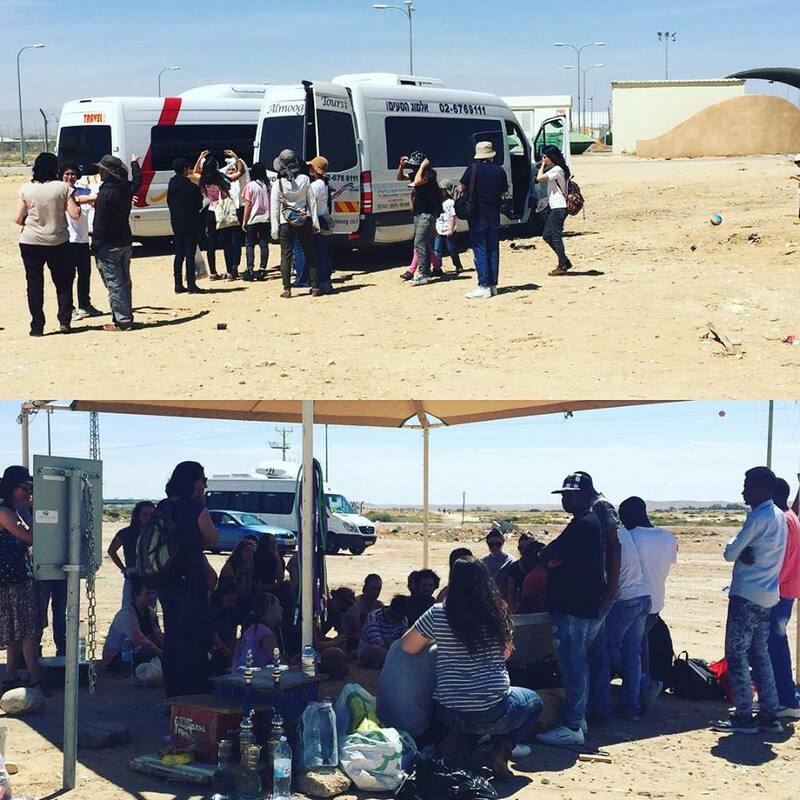 A group of activists in Israel organises tours to Holot in regular intervals. They want to show the inmates that they care about them and that they are not forgotten. They want to show them that there are people who fight for them and that they can live without punishment. 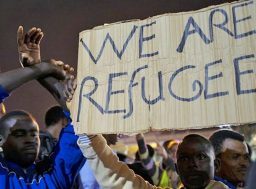 It is tragic to see how these people, who did not nothing wrong other than escaping from violence and persecution in their home country, are treated in Holot. It is a miserable existence without life perspectives. The Israeli government denies that torture victims from Sinai are imprisoned in Holot, but we were able to proof them wrong. An old man showed us severe scars on his leg, caused by burn injuries and hot plastic. The reason why torture victims from Sinai accidentally end up in Holot, is that only few of them are actually recognised as torture victims in Israel. Due to their unclear status, every one of them can be imprisoned in Holot in the middle of nowhere.